Whew! #Choctoberfest officially over! I love chocolate as much as the next, but I think I became a diabetic last week just looking all that chocolate. Time to start eating a bit healthier not only for me, but for my clothing’s sake 😉 I think secretly my pants are screaming “Help Me”. 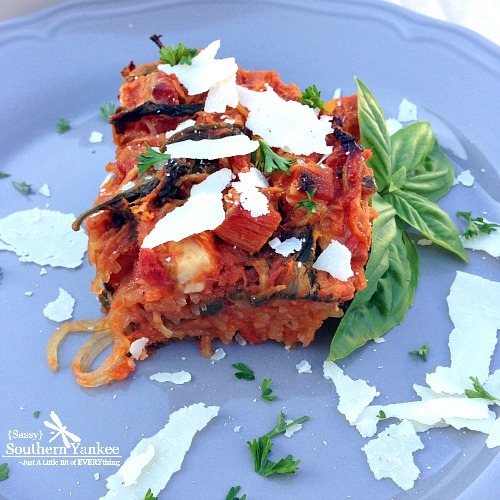 This Baked “Spaghetti” Squash is the trifecta of goodness, Bacon, Onion and Green Pepper paired with “spaghetti” then baked with tomato sauce. 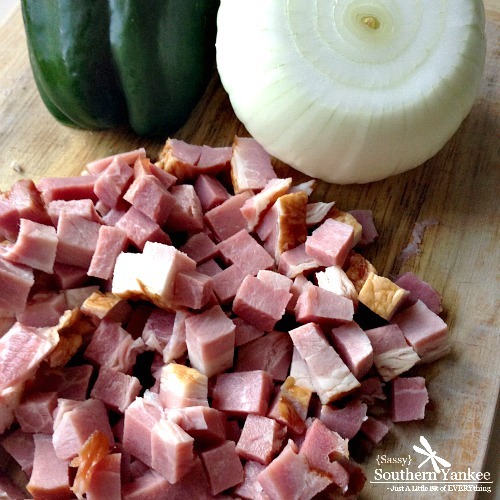 In a large skilled add the chopped bacon and ham; cook over medium heat just until the bacon and ham are just starting to brown. Next add the onion, green pepper, salt and pepper; cooking until the onions are just starting to become translucent. Once all the veggies and meats are heated add the spaghetti squash, spinach and sauce; stir until everything is evenly combined and heated through. Next spray your favorite 9×13 pan (I use two smaller pans so I can freeze one for later) with some non stick spray. 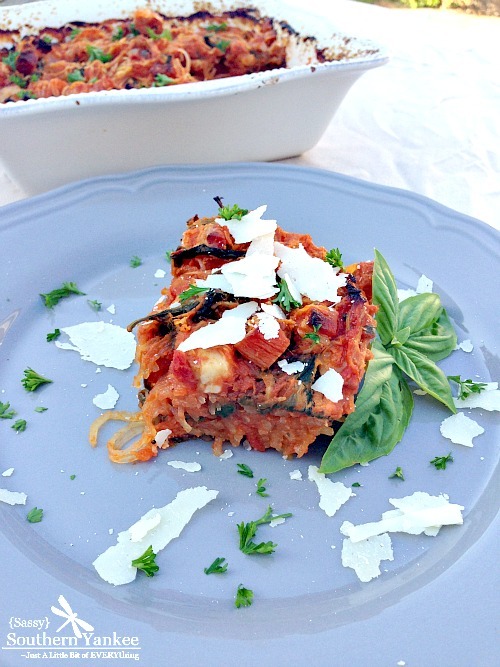 Pour the spaghetti squash mixture into the casserole dish and bake at 400* for about 1 hour. Since everything is pre-cooked you could just eat it out of the pot and not bake it but I love the curst that forms on top when you bake it. If you’re not on the Whole 30 diet feel free to add parmesan cheese on top just before serving. 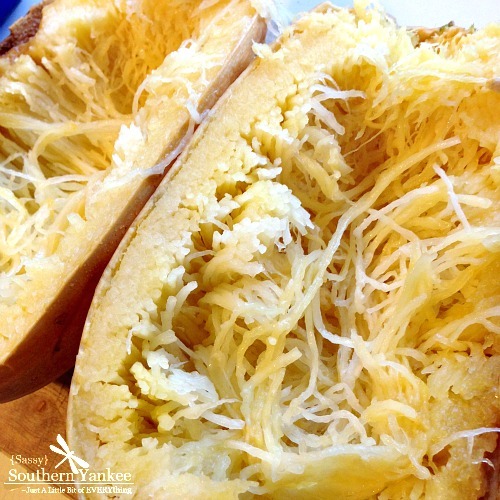 This Baked "Spaghetti" Squash is the trifecta of goodness, Bacon, Onion and Green Pepper It tastes amazing and is low carb, Gluten and Dairy free and Whole 30 Approved. Next spray your favorite 9x13 pan (I use two smaller pans so I can freeze one for later) with some non stick spray. Pour the spaghetti squash mixture into the casserole dish and bake at 400* for about 1 hour. Since everything is pre-cooked you could just eat it out of the pot and not bake it but I love the curst that forms on top when you bake it. If you're not on the Whole 30 diet feel free to add parmesan cheese on top just before serving. 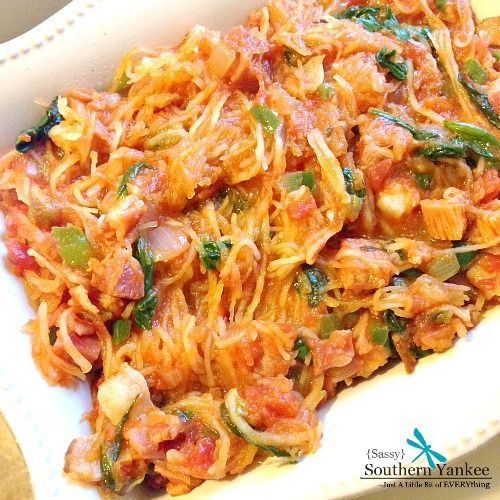 This entry was posted in Main Course and tagged Bacon, baked spaghetti squash, Comfort Food, Daddy's Recipe, Dairy Free, Gluten Free, Green Pepper, ham, Healthy Recipes, how to cook, Low Carb, Onion, Spaghetti Squash, Whole 30 Meals.